Cozy Chicks: Your Favorite Book For Christmas . . . 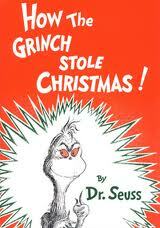 Your Favorite Book For Christmas . . . When writing a mystery, it's best not to introduce too many coincidences in your storyline. It's just not plausible, right? The other day, USA Today ran a story on authors and the favorite book they ever received for Christmas. 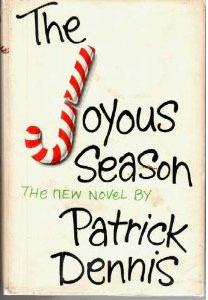 The top picture was of author Chris Bohjalian holding up a copy of "The Joyous Season" by Patrick Dennis. Holy coincidence, Batman--I'm reading that exact book now! Mind you, this book was originally published in 1964. I first read it while in high school. I think I must have read that book about 40 times over the past 30 years (and 25 of them were during my four years in high school). Yet another comfort read. And yet I hadn't picked it up in at least 20 years. For some reason, I reached for it the other night. And then came the USA Today article. Mr. Bohjalian received it as a Christmas git when he was in sixth grade. He described it as a "hilarious and underappreciated 1965 tale of one Manhattan family's near-implosion--and Mom and Dad's near-divorce--in the holiday season. It's narrated by the family's acerbic, insightful and precocious 10-year-old son, Kerry (which he tells us, 'is short for Kerrington, for cripes sakes'). Imagine Holden Caulfied with a sense of humor." I will admit there are things that date it, but if you can overlook that (example: people who smoke all the time, which they did in 1964), it's still quite a funny book. And when it comes to discussing divorce, the situations portrayed are just as contemporary as they are today. I've received MANY books for Christmas and I reread a lot of them over and over again. But the one that stands out in my mind is a Merriam-Webster dictionary I received in 1971. I asked for it because when I'd watch Star Trek reruns, I didn't always know what they were talking about. When I heard a new word, I wrote it down and wanted to look it up. I still have that dictionary (and many more by now), and it's still my favorite. What favorite book did you receive for Christmas? Oh I LOVe Patrick Dennis...my all time favorite book/movie Auntie Mame ... I will have to try this Christmas one. My favroite book received as a Christmas gift was the year one of my older half-sisters gave me the first Trixie Belden book.The Secret of the Mansion. Not only did it start a life-long love of Trixie and friends, it was significant that someone not only knew me well enough to know I would appreciate receiving books, but knew what kind of books I would like reading. I don't have the memory for specific instances like a Christmas gift. Isn't that awful?! :( I wish I did. I also love Patrick Dennis -- Auntie Mame lives on in my mind -- but haven't read this one. Thanks for the suggestion. The Christmas book I remember was a little Golden Book called The Littlest Angel. I kept it for many years but it got lost in a move somewhere along the line. As a child, I cried when I read it but loved it. I can still remember it! I've never read Patrick Dennis--guess I better! But Wind in the Willows is one of my all time favorites. Also listened to it on tape--just as wonderful! I can't remember ever getting a book for Christmas (or rather Sinterklaas here in Holland). My family very quickly learned they better get me a coupon so I can pick out something for myself. I still do have most of my childrens books, but I do remember the story inside, but not when of why I have bought/gotten them. there are three and I still have all my original copies- Lassie Come Home, Up The Down Staircase and Pushing Up Daisy's. Boy was that easy- didn't even have to stop and think about them. I haven't read the book, but will find it and make sure I do.